Chinese explosion aftermath: Officials investigate causes behind warehouse blast and death of 88 firefighters. Lack of basic chemical safety regulations or even “willful neglect” may have impeded firefighters and contributed to their deaths. A firefighter near damaged vehicles as smoke rises from the debris after the explosions in Tianjin, China, on Aug. 13, 2015. TIANJIN, China—Firefighter Zhai Lei and two colleagues were sitting in a fire truck and preparing to retreat from a warehouse blaze in Tianjin’s New Binhai area on the night of Aug. 12 when their faces were suddenly sprayed with shards of windshield glass. Stunned but alive, the men strapped on their helmets. Their efforts to douse the flames had failed, but they had just survived a huge explosion at the warehouse complex. Now, they were scrambling to obey what Zhai said was a commander’s explicit order to pull out of the area. Tian, who had been substituting that night for a vacationing colleague, was one of six firefighters on an initial list of Tianjin fire department deaths following the explosions at the Ruihai International Logistics complex of chemical warehouses. The complex is spread across more than four hectares in Tianjin’s port area, about 140 kilometers (87 miles) east of Beijing. Over the following two weeks, the firefighter death toll ticked steadily higher, reaching 88 on Thursday. That means more than half of the 145 people killed in the disaster were personnel from a firefighting unit affiliated with the Tianjin Port and the Tianjin Fire Brigade. Another 600 people were reportedly injured. That so many firefighters would die in the line of duty struck a painful chord in Tianjin and spurred a heart-wrenching search for answers. Government officials and the public are now pushing to find out exactly what happened that night and why. Within days of the blaze, the search for answers started shedding light on a murky business world tied to the trading, transporting, and storing of hazardous chemicals in China. It’s a business whose practices may have actually impeded firefighter efforts and allowed a company whose executives enjoyed good relations with high-level government officials to flout basic safety rules. Several firefighters who spoke with Caixin said the initial fire report came from a person living in the Vanke Haigangcheng apartment complex, some 600 meters (656 yards) from the warehouses, at about 10:30 p.m. After arriving, firefighters battled the flames with water and foam with such intensity that, within 20 minutes, low pressure in the public water system forced them to roam the port area with tank trucks in search of water. More water was secured, and the dousing continued. But when fire department commanders noticed that the fire was actually growing more intense, the firefighters said, commanders ordered a suspension of all firefighting operations and told all personnel to retreat. Those orders came too late. The first explosion occurred just as the crews, including Zhai’s, were preparing to roll out. And the second explosion was even more deadly. The explosions were so powerful that the China Earthquake Network Center in Beijing reported that the first blast, which struck at around 11:34 p.m., registered a magnitude 2.3. That means it gave off as much force as 3 tons of detonating dynamite. The larger blast some 30 seconds later registered a magnitude of 2.9—a force equal to 21 tons of exploding dynamite. A Vanke Haigangcheng resident who asked not to be named said that after the first explosion he decided to seek shelter in a bathroom. En route, though, he was hit by a flying door that had been torn off its hinges by the second explosion. The blasts damaged about 17,000 apartments that were home to some 30,000 people, Tianjin Mayor Huang Xingguo said at a news conference on Aug. 19. Most were evacuated during the fire that ensued. As of Tuesday, thousands of these apartments remained uninhabited. An area of devastation was also reported at the port facility. 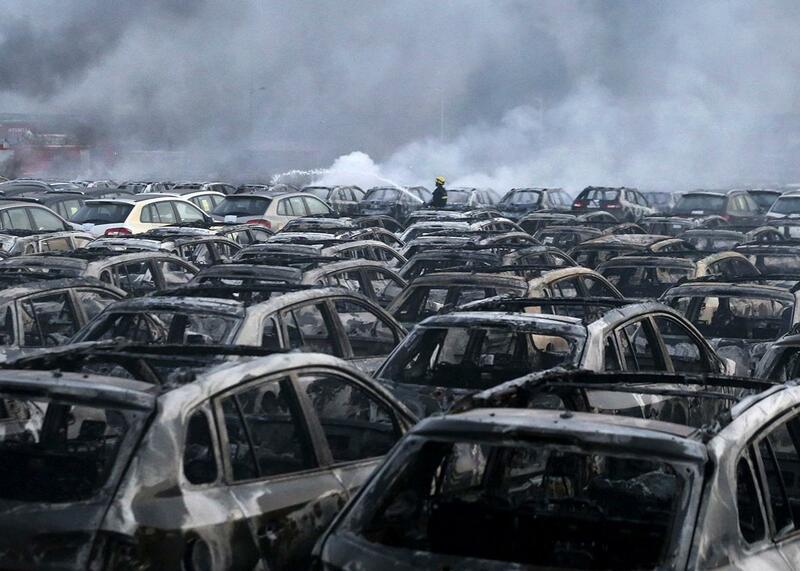 Some 3,000 imported vehicles stored on an open-air lot 300 meters (328 yards) from the warehouses were destroyed by the blasts, Huang said. It’s unclear whether any firefighters asked what was stored in the Ruihai buildings before they started spraying water. Some firefighters said neither their commanders in Tianjin nor warehouse company employees provided any information about the materials inside. Neither did the public know much until five days after the blasts, when authorities released data and estimated the amount of chemicals inside the complex as well as the chemical names. Citing Niu Yueguang, a deputy head of the Ministry of Public Security Fire Department, state-run China Central Television reported Aug. 17 that the warehouse had been packed with more than 40 types of hazardous chemicals. These included about 700 tons of sodium cyanide, 800 tons of ammonium nitrate, and 500 tons of potassium nitrate. Sodium cyanide is an often used to extract gold in the mining process, while ammonium nitrate and potassium nitrate are widely used as ingredients for making explosives including gunpowder. Niu called the Tianjin task “the most difficult firefighting operation” he’s seen in his more than 40 years in the profession “because so many types of (and) huge quantities of hazardous chemicals were involved.” Ruihai’s complex was designed to store 50,000 tons of dangerous chemicals, including 10 tons of sodium cyanide, according to a 2014 assessment prepared by the Tianjin Academy of Environmental Sciences, a local government-affiliated research institute, as part of a warehouse renovation project. A logistics company executive who asked not to be named said Tianjin’s port is a popular transportation and storage hub for hazardous chemicals. One reason, he said, is that the port’s managers are known for relatively lax supervision, or at least they’re more relaxed than counterparts at other Chinese ports. A special team assigned by the State Council, the Cabinet, took charge of an investigation in the disaster. Team officials have issued no public statements about possible illegal activity tied to the warehouse complex, Ruihai, company officials, or Ruihai’s contractors. The official Tianjin Daily newspaper said on Aug. 18 that shortly after the blasts Tianjin police detained 10 company executives. They included Yu Xuewei, the company president, and Vice President Dong Shexuan. Investigators are trying to determine whether dangerous warehousing procedures or even willful neglect had anything to do with the disaster. At a news conference Aug. 19, Tianjin Deputy Mayor He Shushan said officials were taking a close look at a Tianjin-based company that conducts warehouse safety assessments called Zhongbin Haisheng. The company, which is licensed by the State Administration of Work Safety, assessed conditions at Ruihai in August 2014. Investigators have ordered Zhongbin Haisheng to hand over documents linked to Ruihai, He said. Speculation that Zhongbin Haisheng may be accused of wrongdoing stems from a statement by Ruihai Vice President Dong. He told the official Xinhua News Agency that Ruihai had to shop around for a safety assessor because the first company picked for the job pulled out after determining the warehouse site was too close to a residential area. Other questions have been raised about Ruihai’s proximity to the general public. The huge stocks of chemicals were within 1 kilometer (0.6 miles) of at least three high-rise apartment buildings and a subway station. A 2001 standard issued by the General Administration of Quality Supervision, Inspection, and Quarantine said big hazardous chemical storage facilities must be no less than 1 kilometer (0.6 miles) away from public buildings; major public transportation lines, including roads and rail lines; manufacturing centers; and mines. That standard may be subject to interpretation, since a 2011 hazardous chemicals regulation issued by the State Council—the governing agency with the most clout in China—did not include a similar distance requirement. What’s certain, though, is that the Ruihai complex qualifies as a large warehouse: Its total space exceeds the 9,000-square-meter (96,875-square-foot) minimum for an officially classified “warehouse” by a factor of five. While investigators have been combing the blast site and interviewing a variety of people linked to the warehouse, regulators who oversee the hazardous materials industry have come under intense scrutiny in the media. Industry supervisors should have made sure there’s a system for keeping firefighters informed about the types and quantities of chemicals stored at an industrial site or warehouse, according to experts who spoke with Caixin. It’s of crucial importance that firefighters know what they’re dealing with before they arrive at the scene of a fire, academics say, in part because dousing some chemicals with water can make fires worse. But providing this information is almost impossible in China because oversight of hazardous chemicals is sorely lacking, according to a senior executive at a logistics company that handles dangerous chemicals. The executive, who preferred not to be named, said chemical products dealers and cargo-hauling companies they commission to transport goods are required to provide lists to warehouse operators that include the names for and quantities of chemicals being handled. The information also should include descriptions of each chemical’s hazard level and spell out the proper ways of handling goods in case of fire or other emergency. The executive said a document central to the process is called a material safety data sheet. Warehouse workers and emergency personnel, including firefighters, should be able to read an MSDS to determine the melting point and toxicity of a given chemical, as well as storage and disposal procedures and the names and phone numbers of people who can be contacted in an emergency. But in China, the executive said, an MSDS document can be useless. That’s because up to four-fifths of all import-export chemical traders in the country use falsified MSDS data, he said. A trader may intentionally write the wrong chemical name on an MSDS data form to save money, and it is well-known that low-toxicity chemicals cost less to move and store than highly dangerous chemicals. “Many of [import-expert traders] pass off their goods as chemicals with lower or no toxicity on the MSDS,” the executive said. As a result, the executive said, even if a firefighter were to get a relevant MSDS document before battling a warehouse blaze, the data on it might be worthless. Import-export traders are rarely if ever held accountable for phony MSDS documents. One reason is that warehouse operators and insurance companies have neither the resources nor the technical ability to check the data’s authenticity. And customs procedures for checking imports and exports of dangerous chemicals provide little protection, since customs officers generally inspect at random only about 10 percent of all goods processed at all Chinese ports, according to the executive. The disaster inquiry is also expected to focus on the possible role of insider connections. Xinhua said Dong, who also uses the name Dong Mengmeng, is a son of Tianjin’s former police chief, Dong Peijun, who died of liver cancer in 2014. Before joining Ruihai, Yu, the company president, worked as a deputy general manager of the Tianjin branch of the state-owned chemicals conglomerate Sinochem Group. Yu and Dong apparently established Ruihai after agreeing in 2012 to form the warehouse business and give it a good start by tapping high-level connections in Tianjin’s police and port agencies. Such ties in China can be invaluable for obtaining land, business licenses, and permits. The pair opened the warehouse in late 2012. Ruihai received a six-month license to handle dangerous chemicals in April 2014. The company apparently continued that business for months after the license expired. Then in June, Ruihai was licensed again by the Tianjin transport commission to handle hazardous goods. The explosions were likely preceded by a fire in area where nitrocellulose and or sodium sulfide were likely stored, Zhong Shenjun, an associate professor of work safety at Northeastern University in Shenyang, Liaoning Province, wrote in an Aug. 16 blog entry. Zhong serves as an adviser to the central government’s State Administration of Work Safety. He said flames apparently spread to other flammable materials that may have included potassium, sodium, and calcium silicon—chemicals that produce flammable gases and vapors when mixed with water. When firefighters tried to extinguish the fire with water, Zhong said, explosive gases and vapors might have formed. Flames then may have sparked the blasts. The water-chemical reaction theory has been disputed by some experts. Yuan Hongyong, the deputy director at the Institute of Public Safety Research at Tsinghua University, said no one should jump to conclusions about the cause of the explosions before a thorough investigation has been completed. The explosions might have made more intense but not directly caused by the water from firefighter hoses, Yuan said, adding that any speculation about the cause of the disaster showed a lack of respect for the firefighters who sacrificed their lives.